It would seem that an endless source of blog content is going to conferences. Two weeks ago it was HASTAC, this week it was the Comparative Literature Colloquium at UNAM in Mexico City. This occasion marked some sort of a homecoming for me. Masterly co-organized by Dr. Susana González Aktories and Dr. Irene Artigas – the professor that taught me my very first undergrad class – the colloquium gathered many professors from my years at the Modern Languages College and the Literature Grad Program and other CompLit luminaries from the institution. The occasion also marked my return to an all literature audience since I started doing digital humanities, or so I thought. Instead I came across the fundamental reflection around questions such as what makes Comparative Literature distinct? Is there a methodology proper to it? How much it relies on collaboration? and how, in the middle of many and diverse interdisciplinary approaches, we manage to come back to literature? The discussion echoed much of the current debates in digital humanities and, I couldn’t help identify really, really closely with CompLit concerns as much as I do with DH. Even more, I wonder to what extent the discussion, so similar in both fields is, in fact, about what it means to, and how we can study humanities – literature in particular – in our days. In my talk, I launched a provocation – which unfortunately didn’t get any replies for lack of Q&A time – that, in the present, we can no longer think of media (semiotic, platform, and the individual and social behaviors attached to them) as separate from all the others, but instead as complementary. In context, this idea only had to do with the narrative I’m currently studying. In the larger sense, however, it was also meant to appeal to the endless possibilities and complexities that literature itself seems to offer us within the text, of course, but also outside of it. The three-layered notion of medium, I think, offers an interesting branch leading up to different levels of interdisciplinarity to include other arts, diverse materialities and what people – authors, scholars and readers – do with all that. But really, the thought underlying this idea is that literature is way too multifaceted not to be approached from diverse perspectives. All of that has been taken advantage of by comparatists since the field was first instituted at UNAM, and by others like me: unaware comparatists. In light of this, it is not difficult to agree with Dr. Angelina Muñiz-Huberman who proposed in the very first session that Comparative Literature is the locus of literary studies in the present. Interdisciplinarity and cross-pollination can only lead to unearthing some of literature’s complexities textual and otherwise. Her approach was echoed later on by many, but with special clarity by Dr. Gabriela García Hubard who sees CompLit as the place for exchange between not just different literatures, but also between literature and other disciplines. Benefits and affordances granted by the web and other digital technologies, even at UNAM where issues of institutional digital infrastructure are hard to navigate, were also part of Gracía Hubard reflection as avenues of current research. As a matter of fact, many of the projects that were presented during the conference have a substancial digital component. Most notable among them and the one that brought us together, the new website for the Comparative Literature Graduate Program. Far from being just an information site outlining the program, its aim is evidently to become a gathering place for both professors and researchers and students that honors the history of Comparative Literature at UNAM, aids in the development of current projects and paves the way for the future evolution of the field. Such a tool is not just an end product but a processual exploration of what goes on currently and how it feeds from the past. 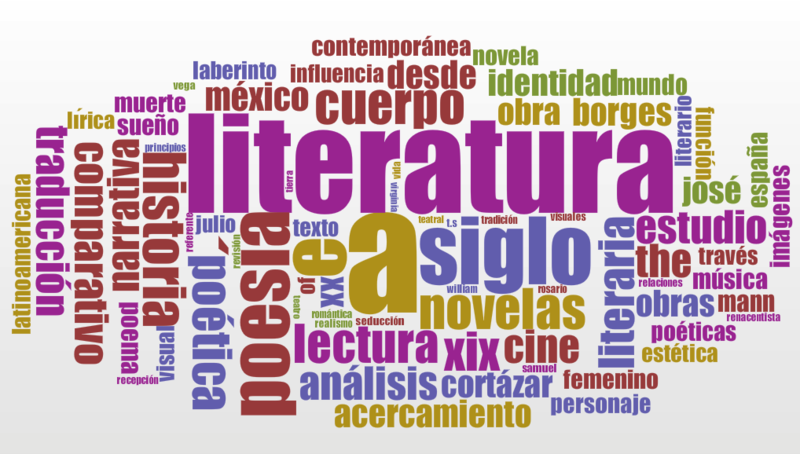 To take a quick glimpse of some of the information available on the website and the possible insights into what goes on in CompLit at UNAM I took the titles of all the MA and PhD thesis contained in the database and ran them through Voyant Tools. We might not be getting the most accurate idea of what some of the research lines are just from the titles, but we can see some recurrent authors, and larger scale topics, areas or approaches studied in roughly the last twenty years. UNAM CompLit MA and PhD theses’ titles. Coming back to the correspondences between concerns of both CompLit and DH, it seems to me that both fields at UNAM are ready to start a theoretical dialogue regarding common practices, approaches and larger research questions. The result of this will, doubtless, be (as it was during the three days the Colloquium lasted) enriching not only to individual participants, but also to literary studies in general, especially when it comes to interrelations of methodologies, approaches, and diverse literatures produced not only around the world but also across time.